When I was growing up, Blue Magic was our family grease and, I have to be honest, as a habit I still keep a tub of it in my cupboard. 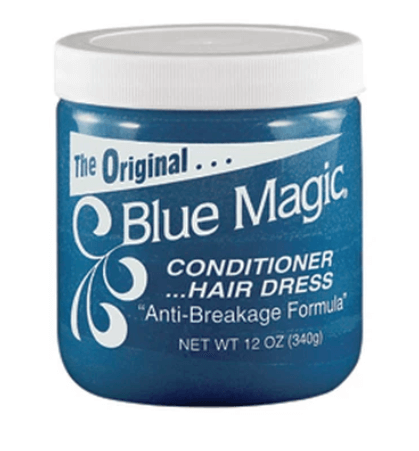 I'm sure many of you will remember what hair grease you grew up on, whether it was Dax, Blue Magic or something else. You may still use it today, and that's perfectly fine. When I went to salons in my youth, they would grease the scalp after doing the hair, and it's only in the last couple of decades that creams have started to be used more. If the scalp produces sebum, this tells me that an oil-based product is best for nourishing the scalp if you don't have any scalp problems such as dryness etc. But if you have a dry scalp this needs to be addressed first by moisturising. Moisturising, especially with a non-scented product, can provide a lot of relief to a dry, itchy scalp, particularly if your scalp is sensitive. If you have a sensitive scalp, your scalp may not get on very well with oils, and this is another reason for using lotions and creams instead. When I see clients in my clinic, my focus is to assess whether their scalp is normal or dry because this will tell me whether I'm going to prescribe a moisture-based product or an oil-based product. I just want to encourage you not to beat yourself up too much about this issue because, whichever way you choose to go, your scalp will still benefit from your efforts. I think there's a lot of confusion as to whether we should grease or cream our scalp, and I can understand why. On one hand you're told that you need to moisturise your scalp and moisture comes in the form of lotions and creams, and on the other hand our scalp’s natural lubricant is sebum, which is an oily substance produced by the sebaceous glands. This makes us think we should grease our scalp instead of moisturise. So which one should I do?